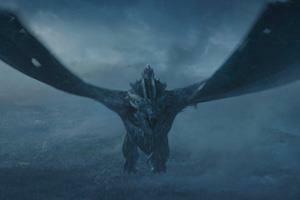 Much has been written and said about these final six episodes of Game of Thrones which begin Sunday (April 14 on HBO). 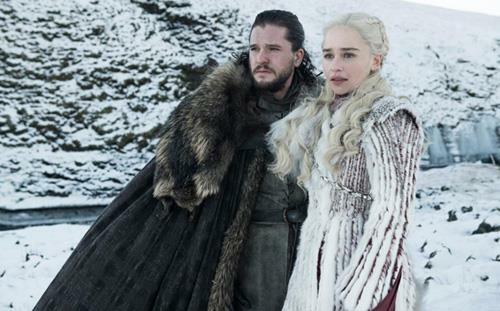 Speculation about how Thrones will end has been fevered and dramatic, and will only become more fevered and dramatic as it nears its final appointment with destiny on May 19. Now-familiar faces like Emilia Clarke (top), John Bradley, Conleth Hill, and Kit Harington (top) have made the rounds on the late-night talks shows and comedy programs — Saturday Night Live, The Late Show with Stephen Colbert, etc. — only to say, no, they won’t tell, they’re sworn to secrecy and, let’s face it, you probably wouldn’t want to know until you’ve seen it for yourself. The truth is that the mystery is almost always more fun than the final reveal. Just look at the way Lost ended in 2010. Lost never really improved on its bravura, inspired first season — how could it? One of the many truly remarkable things about Game of Thrones – and it is remarkable – is how it took an engaging first season and built on it from there. It’s not often that a popular series can be said to improve over time, but that’s exactly what Game of Thrones did. All credit to David Benioff and D.B. Weiss — and HBO — who took novelist George R.R. Martin’s original source material and turned it into something elegant and beautiful and magisterial, on a scale never before seen on the small screen. When it ends in May, Game of Thrones will have aired just 73 episodes over eight seasons. It won’t end anywhere near the century mark in terms of episodes made — The Simpsons, in contrast, aired has aired more than 650 episodes — but there can be little doubting the way Game of Thrones changed the medium of television in its own way. It’s moments like this when it can be instructive — eye-opening, even — to go back to the very beginning, when Game of Thrones was brand new, with just one actor of any prominence, Sean Bean, and a largely unknown, yet-to-be-discovered cast of supporting players. On a bright, wintery afternoon — appropriate for the season — in January 2011, cast members Sean Bean, Peter Dinklage, and Emilia Clarke joined George R.R. Martin, David Benioff and D.B. Weiss for Game of Thrones’ first and only, as it would turn out, press conference before the Television Critics Association. 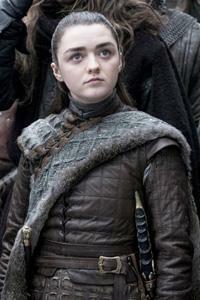 At the time, despite the novels’ cult following, and despite the massive sums of money rumored to be lavished on Game of Thrones’ production budget, few in the room believed Thrones could possibly live up to the critical attention and social-media buzz that surrounded The Sopranos, which had retired little more than three years earlier. HBO was desperate for a series hit that would be both a water-cooler talking point — back in a day when there were water coolers — and a popular and financial success, one that would replace The Sopranos in the pantheon of seminal, ground-breaking television dramas. An expensive sword-n-sorcery epic based on a series of books that only fanboys and fangirls had heard of hardly seemed the ticket, but to their credit HBO decision makers rolled the dice on a bet that, looking back on it today, must have seemed crazy at the time. 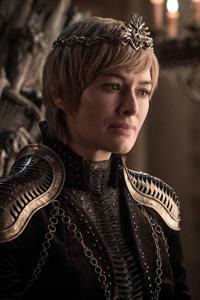 Remarkably, aside from an episode of the British medical soap opera Doctors, and a brief appearance in the made-for-TV movie Triassic Attack (don’t bother), Game of Thrones was Clarke’s first on-camera role. The London-born Clarke, whose father was a theater sound engineer from the British Midlands city of Wolverhampton, had only a handful of theater roles to her name. She was 24 at the time. Her Game of Thrones character, Daenerys Stormborn, “Mother of Dragons,” seemed like a distant, barely formed thought in her mind at that point. “Obviously, that’s the dream,” she said softly at the time, after landing a key ensemble role in an HBO epic few knew anything about, except that it was costing HBO a lot of money. This past weekend, when Clarke made an unexpected appearance during Kit Harington’s opening monologue on Saturday Night Live, the studio audience went mental. Daenerys, of the House Targaryen, “First of Her Name, the Unburnt, Queen of the Andals and the First Men, Khaleesi of the Great Grass Sea and Breaker of Chains,” is now a household name. Martin, the career novelist who created this world, had a hunch at the time, even if others — myself, for example — didn’t. David Benioff, who along with D.B. 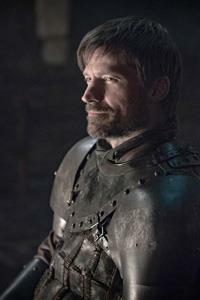 Weiss is the de facto godfather behind Game of Thrones — with veto power over even Martin, if House Stark push comes to House Lannister shove — said Martin was being too modest. Game of Thrones was hardly the first television drama to tackle fantasy. The only successful ones prior to Thrones were high camp, like Xena: Warrior Princess. Barely anyone remembers the short-lived summer series Roar, for example, which was filmed in New Zealand and aired just eight of 13 episodes in the summer of 1997 on the Fox network. It starred a young, then-unknown Heath Ledger, but even that was not enough to draw much interest. “I can’t speak to why other series haven’t worked,” Benioff said back in 2011 before a single episode of Game of Thrones had aired. “One incredible luxury that Dan and I have had working on this is that we’re not making it up as we go along. We’re going into it knowing that we have an incredibly well mapped out, well-plotted storyline that’s going to continue, if we’re lucky, season after season. If the intervening eight years have proven anything, it’s that luck — “if we’re lucky,” Benioff had said — had nothing to do with it. Game of Thrones struck a popular nerve almost from the moment it aired. As well he might. 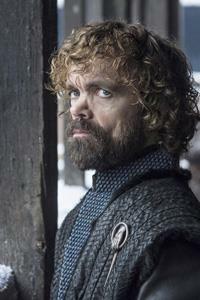 Dinklage could hardly have known it at the time, of course, but he would go on to win three Emmy Awards from seven nominations — in 2011, 2015 and 2018. A fourth, this year, would not be out of the question. Even in 2011, Benioff allowed that one of the things Game of Thrones’ success — or failure — hinged on was its child actors, all unknowns: Sophie Turner, Maisie Williams (left), Isaac Hempstead Wright, even the young looking, preternaturally gifted Clarke. It was an omen of things to come. That was then, and this is right now. Spring is coming, and with it, Game of Thrones’ final grace note.